Valley Dynamo set the standard for arcade grade air hockey tables, and this latest version of the Hot Flash Air Hockey Table is their crowning achievement. 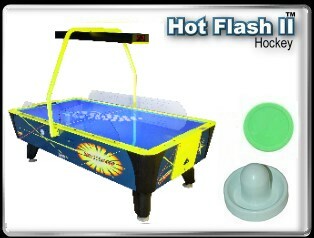 The Valley-Dynamo Hot Flash II 8 Foot Air Hockey Table has all of the pro-designed performance features of the Valley-Dynamo Pro Style but with a screaming hot graphics package and a huge overhead LED scoring display. This is the table for players who only want the best. Players even have the option of adding a black light in the overhead scoring unit for a cool glowing effect. NOTE: Pricing subject to change. Please contact us for the most accurate price of a product.